This is an ERD I've put together as the initial structure for a martial arts or dance type school. One person could have multiple schools, each school multiple students, etc. One schedule per school. Where I need clarification is that a member can be a parent, student or both. With the possibility of having multiple parents, I put the relations into an association table. I'm not sure how to represent that on the ERD, nor am I certain how to represent the relationships between students, schools and class attendance. (Nor am I sure that this is the best design). I'd like an assessment of the design and clarification on the relationships between the tables. Browse other questions tagged database-design or ask your own question. 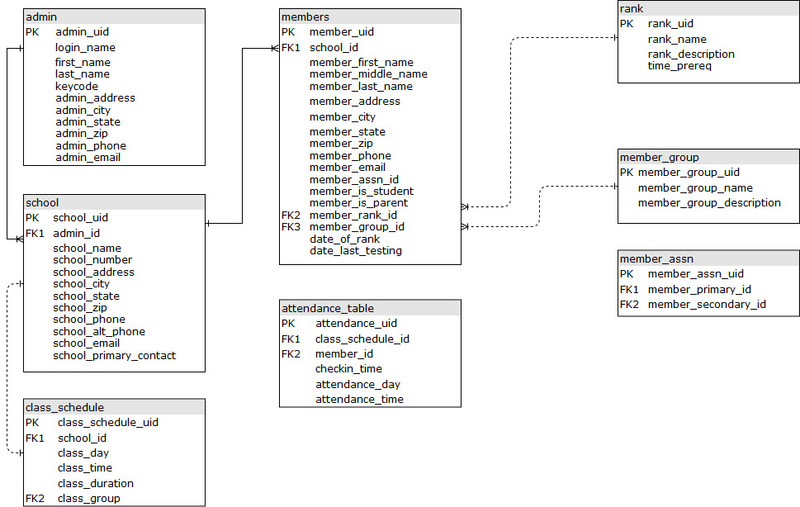 Is following way is right Database model for following problem? How to represent the optionality of a many-to-one mandatory relationship from the Parent to its two Child entity types in an ERD? In a school database, do I need to have repeating data when a student can also be a teacher? How can I represent a relationship of cardinality many to many?